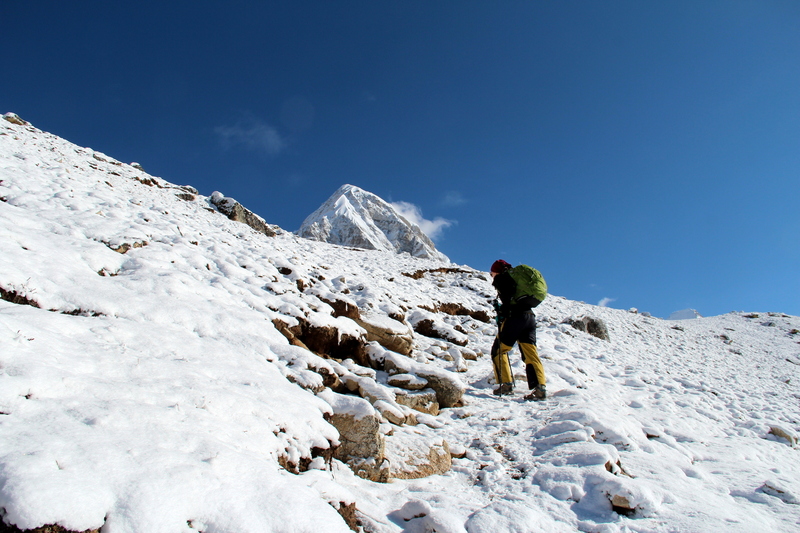 It was our 9th day on the trek, and we woke up in Lobuche, hyper-motivated by what laid ahead. The day was perfectly sunny, and despite the steep, rugged terrain, we made it to Gorak Shep in less than 2 hours. We got a room at the Buddha Lodge, ate a garlic soup (supposedly the best for altitude) and rested until ~10am. 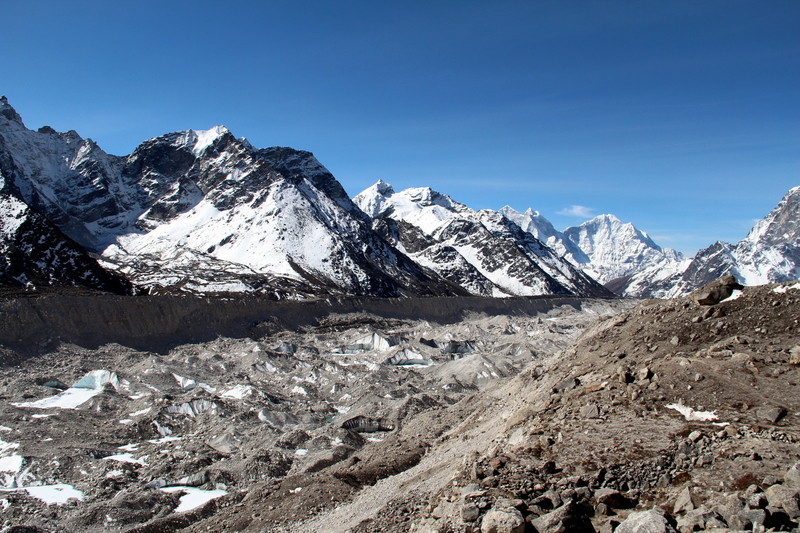 Then, it was finally time to go to the Everest Base Camp. 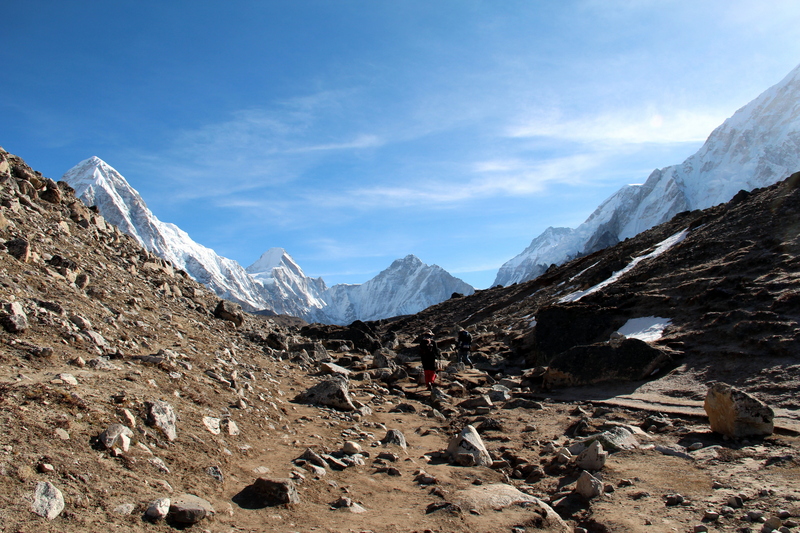 The trail, parallel to the moraine of the Khumbu glacier, was easier than expected, felt almost flat. 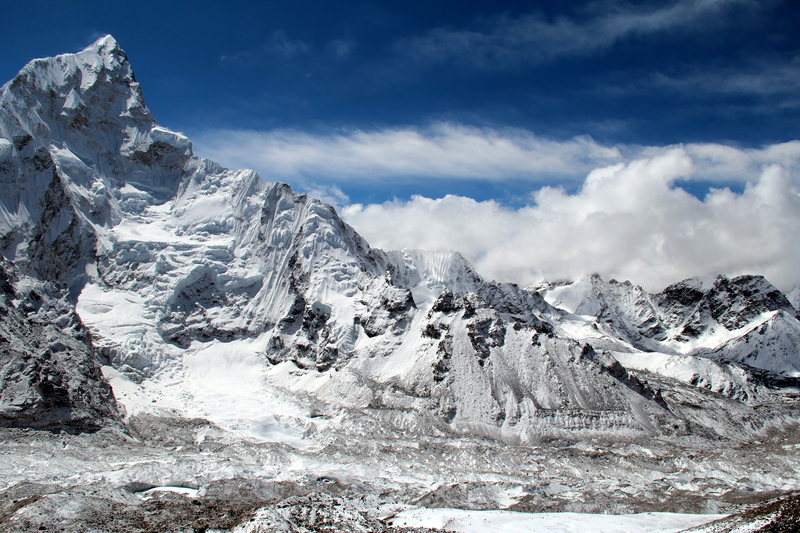 After about 1 hour, we started to get some views of Everest, escorted by Nuptse and Lhotse. 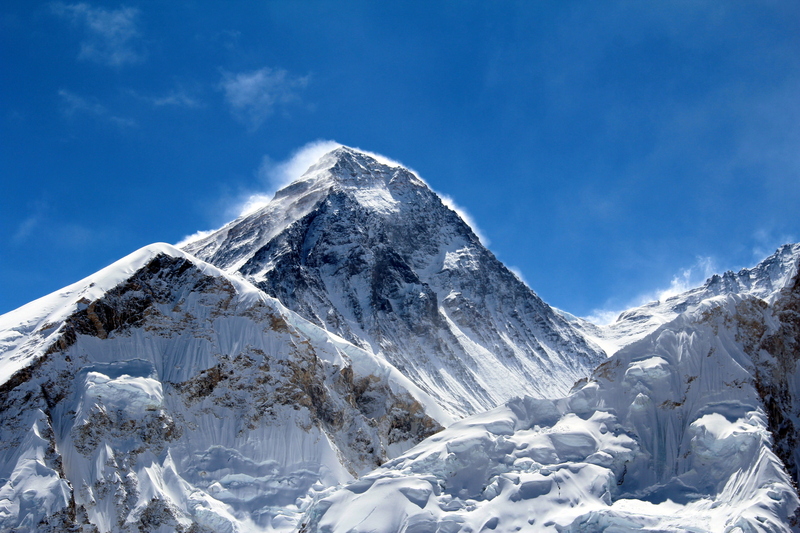 Everest itself would soon disappear behind them, and we would have to wait for the following day to get a good look. 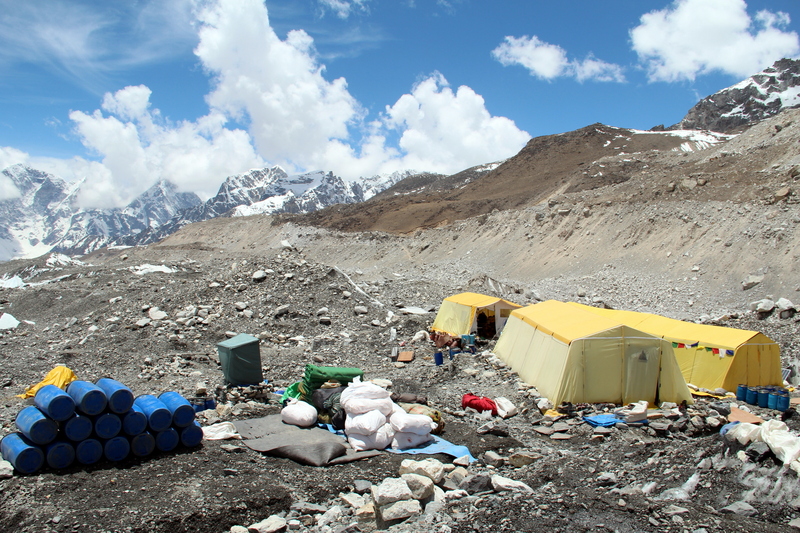 Half an hour later, we spotted what was left of base camp; 3 yellow tents at the foot of the Khumbu icefall, where 2 weeks earlier or any other May, there were hundreds. 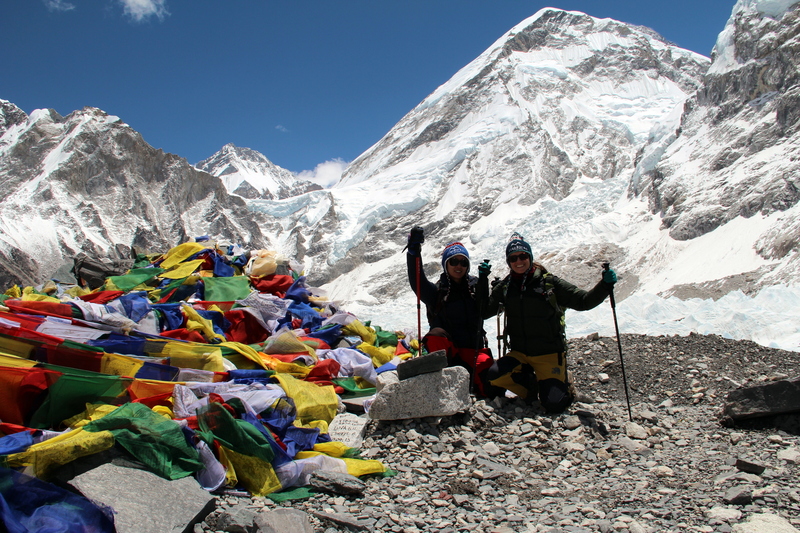 We descended to the middle of the camp area, marked by numerous prayer flags, but even the typical sign “Everest Base Camp, 5,365m” was gone. 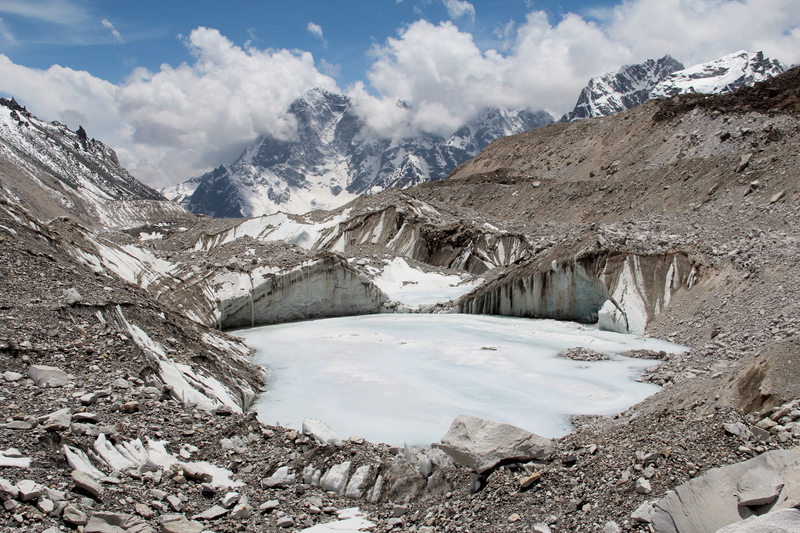 We wandered around, observing the sherpas that were finalizing the dismantling, and trying to visualize what had happened. It felt desolate. 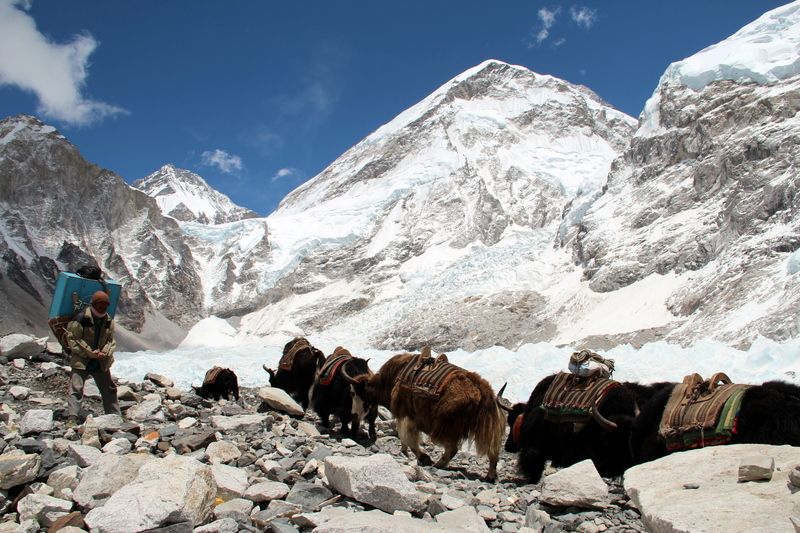 We hiked back to Gorak Shep and warmed up at the teahouse. That evening, as we devoured momos (dumplings) around the dong-powered heater, a strong snow storm unchained outside. 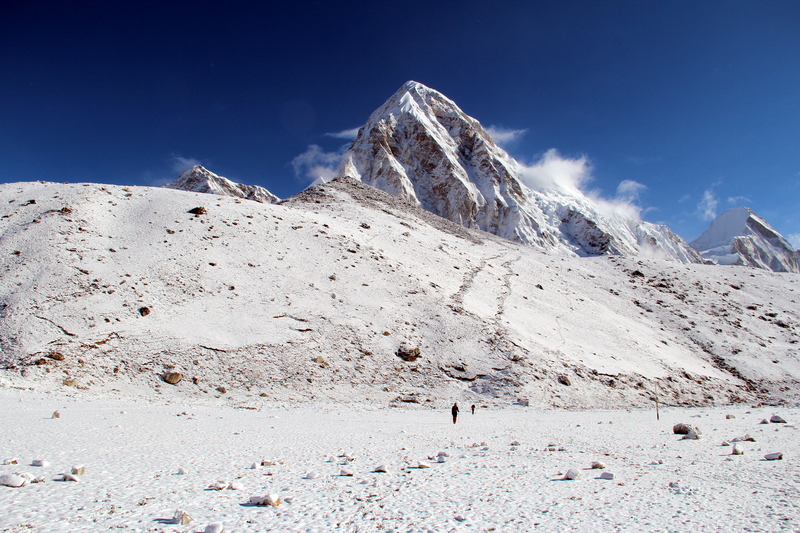 We wondered if we would be able to climb Kala Patthar the next day. On day 10, we woke up at sunrise, before 6am, and saw that everything was covered in a mantle of snow. Our sherpa, Lama, was suffering from mild altitude sickness, so Elena gave him Diamox and Ibuprofen and told him to rest. 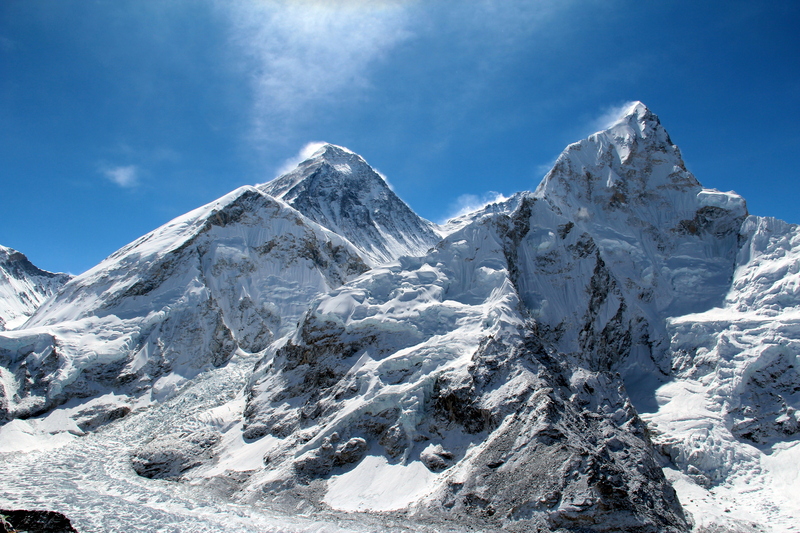 We would climb Kala Patthar (5,545), which offers the best views of Everest, solo. The hike was steep from the beginning, and tough due to the altitude. The fresh snow, about 10 inches, made it more exhausting. Luckily, a group had set out before us and opened trail, so we followed their footsteps. 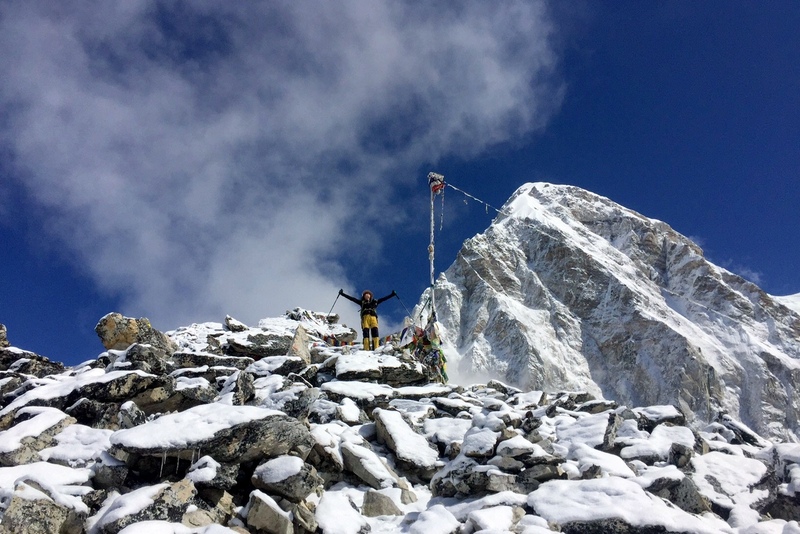 We pushed ourselves at high pace, empowered by the amazing views: Pumori in the direction we were headed, Everest and its massif on the right, Ama Dablam and other seven-thousanders in the back. The skies were blue and this was the culmination of the whole trek. After about 1 hour, we reached a sub-summit, marked by stone piles. We caught up with the group ahead of us, they were tired and had decided to turn around. So we climbed the last 100 vertical meters completely alone, opening trail in the snow, feeling exhilarated and breathless. The rewards, the perfect views at the top and the feeling of accomplishment were on par with the effort. We hang out at the summit for almost 1 hour, snacking, chatting and taking tons of pictures (another trekker came up and helped with those). As we started to descend, the clouds came in and obscured the view; you must go as early as possible. The trail, or lack thereof, was slippery, and we descended carefully. It was shortly before 11am when we got back to our teahouse. The last 3.5 hours had been some of the best in my life. Our sherpa was feeling better and although we were tired, we decided to start hiking down immediately, try to make it back to Lukla in 3 days.